The WikiLeaks Twitter account has announced that it has high level information that the organization’s founder Julian Assange could have his political asylum the Ecuadorian embassy revoked for him to be arrested by the British government within hours. We need to be ready to shake the earth should this happen. We need all hands on deck for this one. 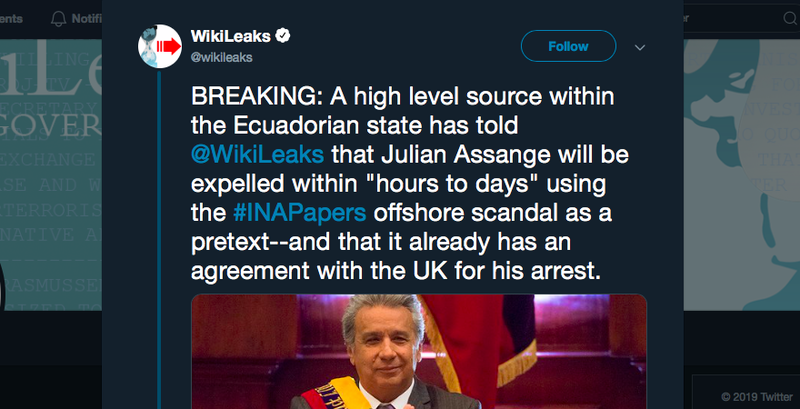 “BREAKING: A high level source within the Ecuadorian state has told @WikiLeaks that Julian Assange will be expelled within ‘hours to days’ using the #INApapers offshore scandal as a pretext — and that it already has an agreement with the UK for his arrest,” the leak publishing outlet tweeted, with a link to a story about the INA Papers leak. The pretext that is being used is almost irrelevant, because it has nothing to do with truth or reality. Assange has been a target of the US-centralized power establishment ever since WikiLeaks began publishing authentic documents exposing the malfeasance of its leaders a decade ago, and strings are being pulled around the world to funnel him into its jaws. That’s all that this is, but it should surprise no one that the pretext is bogus as well. Journalist Elizabeth Vos wrote an article for Consortium News the other day summarizing the false narrative being spun by the Ecuadorian government that the conditions of asylum have been violated by the WikiLeaks account (not Assange) tweeting about a scandal that has rocked Ecuador’s president Lenin Moreno.